Sun. 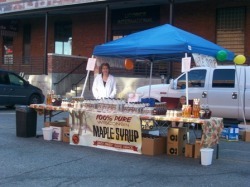 July 15- Aksarben Farmer's Market (9-1 pm) *If we have syrup left! the latest information. If ever in doubt, call to confirm. Our phone number is: 715-551-1090. ​Check Facebook for the latest up-dates. Our syrup is available in Lincoln and Omaha, NE , Colorado, and Beloit, WI while supplies last. You will find locations listed on our Products & Pricing Page.